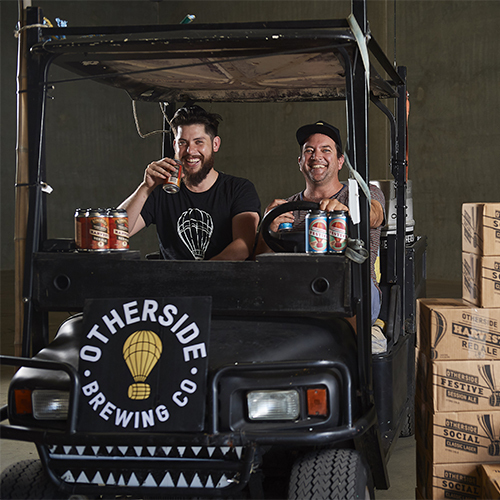 The overwhelming response to what was a one-off brew for a music festival has led the team behind Otherside Brewing Co. to commission a new custom built brewery here in Perth. Since their humble beginnings in Fremantle as a gypsy brewer, offering just one brew, Otherside now have five lines available at around 100 bottle shops and 50 tap points across Perth. To meet the unprecedented demand, Otherside Brewing Co. have brought forward the creation of their own brewery to late April 2018. WA’s newest brewery will be located at 84 McCoy Street in Myaree and is set to open late April with work already underway following the development green light by the City of Melville. The Otherside team have been on the hunt for the right space and the new brewery will be contained within a 1,000sqm warehouse in a street known for a blend of retail and business precincts along with nearby residential occupants. Upon completion, the 20-hectolitre brewery and six fermentation tanks will initially produce about 300,000 litres of beer per annum, but the brewhouse facilities can scale up to well over one million litres per year. A cask canning line has also been ordered which will be installed adjacent to the brewery. Cold store, in-house distribution facilities are also being developed. Otherside Brewing Co. Brewer, Rhys Lopez, said the Myaree complex would allow the team to control the entire supply chain and offer consumers a unique experience. “Respecting the product at every stage of the process is what leads to a truly genuine and authentic brand and we are excited that this vision will become a reality late April,” Rhys said. “There will be a cellar door along with a tap room showcasing our beers for consumers to experience and enjoy. Similarly, there will also be rotating food trucks and a range of products to take-away,” Rhys said. Otherside Brewing Co. Director, David Chitty, said the brewery will meet the growing demand and is part of a greater strategic plan for the brand and business. “The appreciation of fresh, natural, flavoured and independently owned beer has grown enormously in WA in recent years. Consumers have told us they are loving our product and we realised to meet growing demand and control the quality of our products we needed our own end-to-end facility,” David said. Hundreds of Western Australians have already become ‘Beer Tycoons’ as part of the Otherside’s ‘Own a Bit of a Brewery’ campaign that lets members become involved in the brewery. There is still the opportunity to purchase the $250 package allowing which allows members to have their name inscribed on a brick in the new brewery, have a say during the creation and naming of some new brews, attend the brewery opening party and receive merchandise, special offers and invitations to brewery events and Beer Tycoon AGMs.